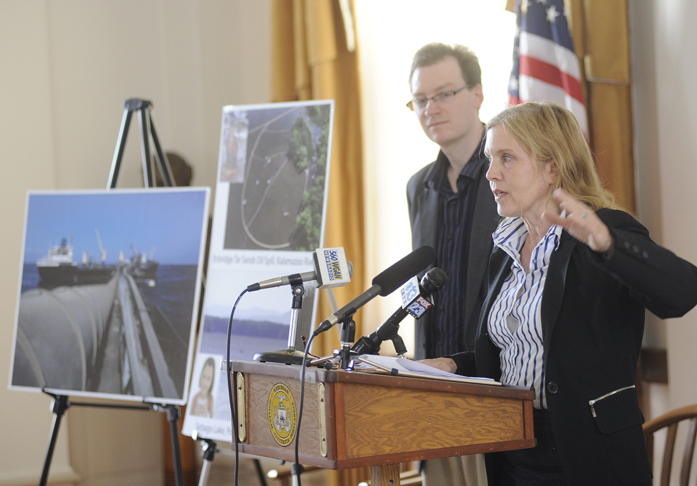 Environmental groups protest the possible flow of tar sands crude oil from Montreal to Portland even though no firm plans have been made to involve Maine. PORTLAND — Brooke Hidell of Casco has lived near the Crooked River for much of his life. He has fished and taught others to fish there. He understands the river’s role as a feeder into Sebago Lake, the main source of drinking water to residents of Portland and other surrounding towns. Hidell also has counted the number of times the Portland-Montreal Pipe Line crosses the Crooked River. Six times. For him, that translates to at least six chances for an oil spill that would threaten the waterway that’s so dear to him and so vital to the region. As speculation increases about the possibility of tar sands crude oil flowing from Canada through Maine, environmental advocates are banding together to warn Mainers of what they see as a risky and dangerous proposition. Hidell joined representatives from the Natural Resources Council of Maine, the Natural Resources Defense Council and the local chapter of the Sierra Club to protest what they feel is a growing threat to Maine’s quality of life. So far, nothing has happened, but there is movement in Canada that suggests it’s only a matter of time, according to Dylan Voorhees with NRCM. Enbridge Corp., a major petroleum player in Canada, already has applied for a permit that would reverse the flow of oil between Ontario and Montreal. Voorhees said he sees no scenario in which that oil would stop there. What he and others predict is a similar reversal of the Montreal-to-Portland pipeline. That would allow the Canadian oil to be loaded onto tankers in Casco Bay and then shipped to refineries. Voorhees said that development would provide no real benefits to Maine, but would threaten the environment in countless ways while increasing profits for wealthy oil companies. For years, light crude oil has flowed from Portland to Montreal. What would be the difference in seeing oil move the other way? Shelley Kath with NRDC said the difference lies in the type of petroleum. Tar sands oil is dirty and corrosive, opponents say. Just to get it moving through pipelines, the thick substance needs to be diluted with chemicals. Kath said tar sands oil is much more likely to spill than traditional oil. Hidell doesn’t want to see that spill happen in his Crooked River. Nevertheless, Canadian companies are committed to getting the most out of this type of oil, even amid challenges. A Montreal-to-Portland route would be just a small part of what industry watchers expect to happen over the next decade. How that could play out is unclear, Voorhees said, and the decision would involve multiple jurisdictions. In Maine, the pipeline is operated by Portland Pipe Line Corp. of South Portland. The company recently declined a request for comment about its plans, but its website says there are no active plans to move crude oil from western Canada through Maine. Four years ago, Enbridge introduced a project called Trailbreaker that would have moved tar sands crude oil from Alberta to Montreal and eventually to Portland. That project was shelved because of the recession, but now it appears to be moving forward in smaller pieces. Plans to move this type of oil have spurred debate elsewhere. TransCanada Corp. has faced stiff opposition from environmentalists in the U.S. to its Keystone Pipeline that would transport oil down the country’s backbone to the Gulf Coast. Voorhees said the focus needs to be on energy efficiency and alternatives, not increased oil production.